BH Fitness RS8 Recumbent Exercise Bike takes the features of the RS5 anywhere you want to go with its environmentally friendly GP (Green Power) self-generating system. This exercise Bike has a weight capacity of 300 lbs and also has transportation wheels for easy displacement of its position. The Poly-V Belt and Large Foot Pedals with Sure Grip ensures swiftness in your workout. *Note: Most of the sites, stores or shopping portals listed above sell BH Fitness RS8 Recumbent Exercise Bike with discounts and other exciting offers. 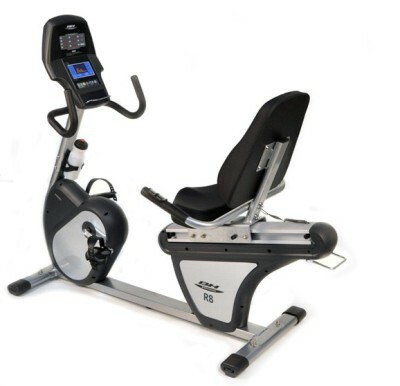 There is a possibility that the some of above websites are not selling BH Fitness RS8 Recumbent Exercise Bike now. Toughtrain.com is not liable for such cases or instances. Also we do not recommend any seller for BH Fitness RS8 Recumbent Exercise Bike and a buyer should buy from where he/she gets best deal with quality of products, service and on time delivery (shipment).